A hundred years ago, a young couple in Detroit embarked on a true love story. Join Ford House as we celebrate the 100th anniversary of Eleanor and Edsel Ford’s wedding! We are honoring their Century of Love with a Ford family wedding exhibit, a new bronze sculpture of the couple, a vow renewal garden party at the estate, as well as tours, programs and more! See how the Ford family celebrated a Century of Love, and discover wedding traditions new and old. Come to Ford House June 26-Nov. 6, 2016, for Down the Aisle: 100 Years of Ford Family Weddings, an exhibition of wedding gowns, fashions, customs and memories. The exhibition is included with Ford House admission. Also be sure to check out our special Century of Love events and tours to learn more about the exhibit and Ford weddings. Below is a sampling of the gowns you will see in the new exhibit, and the brides who wore them! The love between Eleanor and Edsel Ford is captured in a new bronze sculpture of the couple unveiled at Ford House June 13. The life-sized sculptures show the couple strolling arm-in-arm, and is placed in the gardens at the estate where they enjoyed many treasured moments together. The life-sized statues were created by Studio EIS, a Brooklyn, NY, team of sculptors and visual storytellers who for 40 years have been making works in bronze to represent sports icons and historical figures, including Thomas Jefferson, George Washington, Franklin and Eleanor Roosevelt, Frederick Douglass and Abraham Lincoln. The complex process of building the sculpture of the Fords took more than a year of research, planning, sketching, sculpting, molding and finally creating and installing the finished work. Visit Ford House this summer to see this beautiful tribute to Edsel and Eleanor Ford! A new life-sized bronze sculpture of Edsel and Eleanor Ford was unveiled at Ford House on June 13, 2016. It is a beautiful tribute to the Fords' legacy and honors the couple’s 100th wedding anniversary. The sculpture of the pair walking arm-in-arm was placed in the estate’s garden, where Edsel and Eleanor enjoyed spending time together. “From the original clay models to the molding and foundry processes, it took a team of nearly 20 people to capture Edsel and Eleanor’s spirit and disposition in the sculpture – and we think we’ve achieved just that!” said Ivan Schwartz of Studio EIS, who created the new sculpture. “The love between my grandparents is what forged the Ford family, and I am delighted to see their legacy commemorated in a monument for generations of family and visitors to enjoy,” said Edsel B. Ford II (left), chairman of the Ford House board of trustees. Members of the Ford Family were present for the unveiling, including (from left) Ellie Ford, Lynn Ford Alandt, Lindsey Buhl, Martha Firestone Ford and Edsel Ford II. The life-sized sculptures were created by Studio EIS, a Brooklyn, NY, team of sculptors and visual storytellers who for 40 years have been making works in bronze to represent sports icons and historical figures, including Thomas Jefferson, George Washington, Franklin & Eleanor Roosevelt, Frederick Douglass and Abraham Lincoln. The EIS team used the “lost wax” process to create the bronze sculptures. That involves first sculpting in clay, the creating a mold that will be taken to a foundry to be cast in bronze. The process takes many months. For the Fords, Ivan Schwartz, the studio’s founder and director, says the team studied video, photographs and historical artifacts to put together designs for the statue. “We had to glean all the historical information we could -- heights, weights, style of clothing, ages, exact year, in addition to all the best references that we could find from portraits,” Schwartz says. This is one of the historic images of Eleanor and Edsel Ford the team from Studio EIS used to create the bronzes. Ivan Schwartz of Studio EIS says there is “extraordinary craft” required from the sculptors working to create these original works. “We are careful in what we do.” Visit Ford House this summer to see the finished work for yourself. The finished sculpture was placed on the Ford House estate near the lagoon – in the gardens of the estate where Eleanor and Edsel Ford raised their family and enjoyed many happy times together. 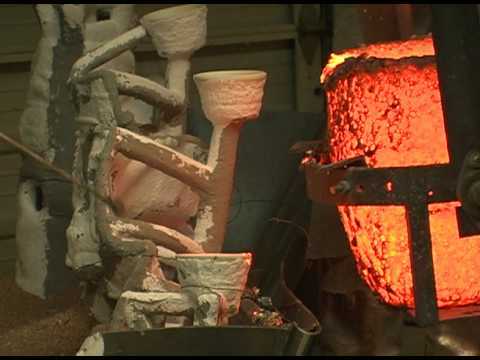 VIDEO: This shows the "lost wax" casting process similar to what was used to create the bronze sculptures of the Fords. “The finished piece is really quite stunning. You can see the craftsmanship that went into every step of the process,” says Ivan Schwartz of Studio EIS. Throughout the years, many brides, grooms, engaged couples and about-to-be engaged couples have come to Ford House to capture a special moment in their own love stories. Here is a gallery of photos they have shared with us, and you can add yours by sharing it to our Facebook page, HERE. Be sure to include your names, your photographer, and the date of your wedding or engagement. On June 25, Ford House honored Eleanor and Edsel Ford’s Century of Love when 55 couples renewed their vows in the estate’s gardens. Macomb County executive Mark Hackel officiated the ceremony, and dinner and dancing followed. It was a beautiful celebration of the Fords’ legacy of love! From a new exhibition to a vow renewal and garden party, and from afternoon teas to fascinating workshops, Ford House has many fun and engaging activities planned to commemorate the 100th wedding anniversary of Eleanor and Edsel Ford. To register for an event, go to www.fordhouse.org/events.